CINCINNATI -- A building at 7th and Race that has been empty for years saw lots of activity Monday as workers prepared for a full renovation. A rendering of a room planned for the Kinley (provided). 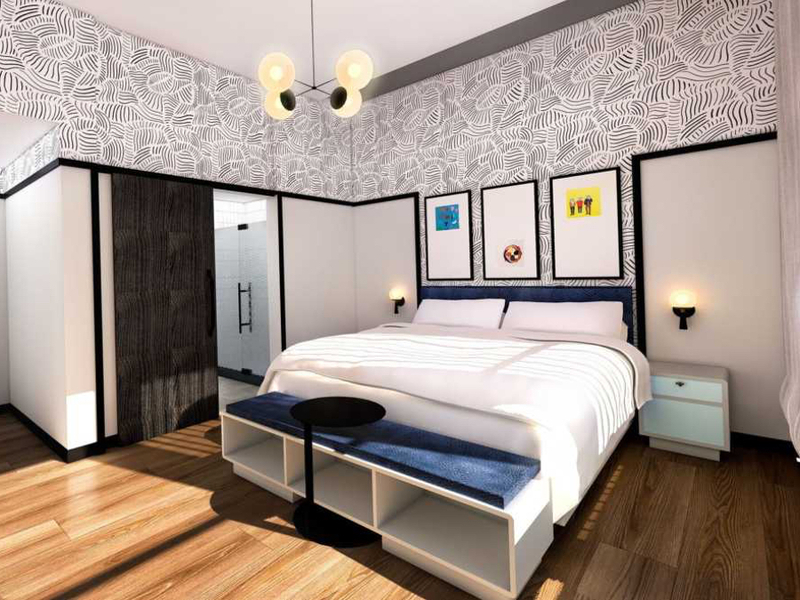 The Tennessee-based Vision Hospitality says it's transforming the space into a Kinley, a 94-room boutique hotel with a restaurant and coffee bar. 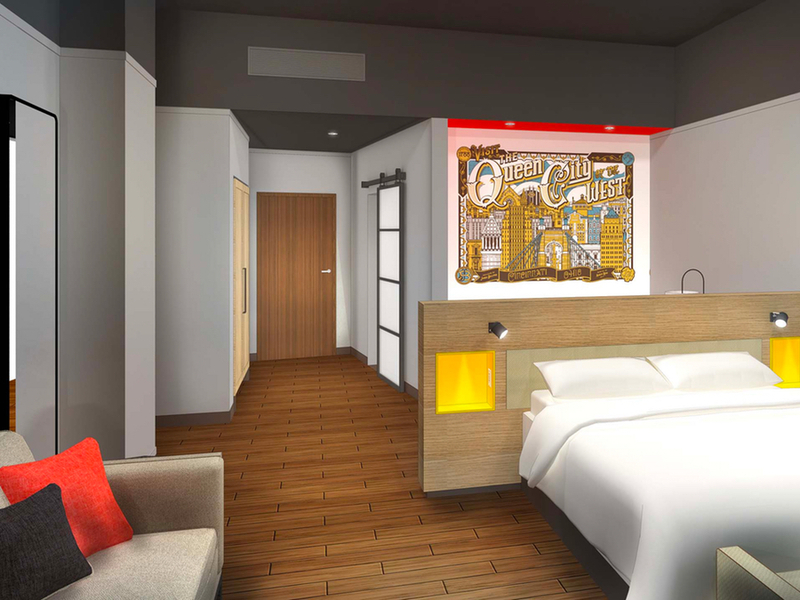 It would be the company's first hotel project in Ohio. Vision's project is one of two hotel projects city officials are considering for tax incentives this week. The projects are part of what the Cincinnati USA Convention and Visitors Bureau says is a bit of a hotel building boom here, with a half-dozen projects in the works for Cincinnati's urban core. "Look around downtown Cincinnati and the surrounding region, I mean, everything is new," Julie Calvert, the convention and visitors bureau president and CEO, said. "All the revitalization that has happened, the rebirth of the urban core of downtown Cincinnati and up to Over-the-Rhine and Washington Park, and now even further out into the West End. I mean, this is a completely different city than it was five years ago, just 10 years ago." Cincinnati went more than a decade without a new hotel not that long ago. But the Queen City could see about 2,500 new hotel rooms come online in the next three years. A rendering of a room planned for the Cambria Suites (provided). On Sixth Street, another empty building that was once home to a shoe factory is going to be renovated at a 130-room Cambria Suites hotel next to Procter & Gamble's headquarters. They're asking for $5.2 million in tax incentives, saying the $10 million project would create 24 permanent jobs and 150 temporary construction jobs. For the Kinley, Vision Hospitality is seeking $11.5 million in tax incentives, saying its $13 million project would create 52 permanent jobs and 43 temporary construction jobs. Real estate consultant Spencer Kron said developers depend on the incentives. "Without those, it actually wouldn't be done, it wouldn't be worth the headaches and the hassle," he said. Calvert said Cincinnati can still use more boutique hotels. The convention and visitors bureau numbers show occupancy rates have grown over the past two years, and so have room rates. "Demand keeps building and building in this city every single day with new visitors coming in, bigger conventions, a lot of what we call 'transient travel,'" she said, "We're really a healthy corporate town." The convention and visitors bureau is bullish on new builds. "Developers have an eye for the future, so when you see these new builds happening in these old buildings, that's part of the character and fabric of our community."